Life is stressful and complicated – I am fairly certain that we can all agree on that. Many families either have two parents working or are single-parent homes. Add to that schedules for children that require families to be in multiple places at the same time and you find stress – how to feed the family, be involved with both children, work, get laundry done, and so on. Other stresses for people with or without children include travel for work, long work hours, having to work holidays, not being able to make ends meet, committing to too many things, not having enough time, eating poorly, inability to accept things as they are, and failure to take time to relax. Of course, those just scratch the surface. I am a mother of two, one of whom has a chronic illness that she will never grow out of, a lifelong situation that has changed her life and those of me and the rest of the family. We face the stresses of changes in her condition, hospital stays, lots and lots of doctor visits of various types, and the fact that even simple things like having her teeth examined by a dentist are complicated. That doesn’t even begin to describe the stress of trying to make sure that our son, who doesn’t have health issues, doesn’t feel neglected. Stressors abound. In view of all this, I have been trying to find ways to de-stress, lessen my anxiety, and take care of myself. I want to be a better worker (I work part time), better spouse, and better mother. I have found that to be impossible as long as I am stressed to the max, anxious alm0st all time time, and beginning to see physical side effects of stress. Here are a list of things that I have tried and found help me. Some or all of them may appeal to you. I hope that at least some of them will help you as well. Soak your feet in hot water and Epsom salts. I use about one cup of Epsom salts in a dishpan that I use specifically for soaking my feet (purchased on Amazon, but can probably be found at Wal-Mart or Target). I make the water fairly hot and soak for 10 minutes or so. Then put moisturizer on your feet and cover with stocks. I highly recommend this an hour or so before bed – it even helps me sleep. Solitude. Sometimes you just need a brief break – some quiet to either contemplate the situation or to not think about it at all. As I mentioned earlier, I have two delightful, wonderful children – one of whom is very chatty. Sometimes I just need a few minutes of quiet to gather my thoughts. In my experience, I have less stressful days when I can have 15-20 minutes of time to myself. Fifteen minutes to yourself when you get home. I highly recommend taking fifteen minutes or so when you get home to sit in a quiet place and unwind. Ask your children to give you a few minutes before asking you anything – or go in your room and shut the door. Let them know it will just be a short time. Read for a few minutes, rock in a rocking chair, crochet, write, or whatever else helps you relax. If just sitting helps, by all means sit and be still. Keep a journal. Write out the good things, as well as the bad. You can look back at the good memories on days you need something to perk you up. Also, seeing what you’ve overcome can help as well. In addition, sometimes writing out a problem can help you see things more clearly. Remember, there is no rule that says you have to keep any or all of your journal. If you feel better burning, shredding, or otherwise disposing of what you’ve written, then do so. Be sure to get enough sleep. At least once a week, go to bed at earlier than normal to make sure you get a good night’s sleep. If you have trouble sleeping, try getting more exercise. If that doesn’t work, talk to a doctor or look into other methods of getting help with sleep problems. Clear some clutter. Believe it or not, by organizing, you will make yourself feel better. Clutter is a source of stress. When you cannot find something, you get frustrated and worried, especially if it is something like car keys or cell phones. It results in time spent looking for things rather than being productive. Exercise a little every day. There are some creative ways to work exercise into your day; do some research on Google. Even 20 minutes a day is a big help, and may help you sleep better too! Make a humor file – collect articles from magazines or newspapers, comic strips, pictures, etc. – anything that makes you laugh or smile. Pull it out on tough days. Read, read, read. Sometimes curling up with a good book, whether it is fiction, nonfiction, science fiction, book, magazine, or whatever, is a great escape for a while – long enough to relax and unwind a bit. Practice gratitude. If you are feeling stressed or depressed, sit down and make a list of five things that you are grateful for; it doesn’t matter what it is. Start small: a flower, the breeze, waking up this morning, the tree outside your window, the sunset. Cut back on junk food, caffeine, and sugar. Don’t overuse alcohol. When stressed, focus on what you can control – and stop worrying about the things that you can’t. Keep telling yourself to do that until it gets to be a habit. Worrying about things you cannot change won’t change things, won’t make them better – but it can make your stress worse and make you sick. Cut back on electronics and media. Keeping up with world happenings is a good thing overall, but it is negative in general. Bad news sells papers. Cut back on the amount of time you spend on computer, playing games, reading the news, following the news stories. Spend more time with family, reading, exercising, or doing a hobby. Try meditation. Start small – mediate for five minutes. Keep practicing – it takes time to build up but any amount should help your stress levels. Take an online course and stretch yourself. Stop trying to be someone else, for someone else – or trying to live your life to please someone else. Be yourself – live your values and your interests and follow your dreams. 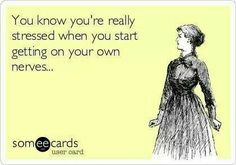 You’ll find that relieves a LOT of stress. Sit on the back porch and enjoy your favorite beverage as the sun rises or sets. Enjoy the sounds of nature. Practice healthy breathing – many people don’t breathe correctly and stress can affect breathing as well. Learn to acknowledge all of your feelings – including the negative ones, like anger and jealousy. Recognize when you are feeling them, explore why you are feeling them, and acknowledge them. Then let them go. Cry – let it all out. Sometimes you just need to vent and let out some of your internal pressure. It is a way of releasing pressure and stress. Make a list of activities that you enjoy doing – and do one. Say no to something that you really don’t want to do, or say no if you don’t have enough energy to commit to something else. Forget what other people say or think – this is for your own well-being. Stop watching TV and read instead. Set your own goals and get away from living by someone else’s rules and goals for you. Determine your core values and make sure your job and your lifestyle are aligned with them. When they aren’t in agreement, there is a disconnect and it can be very stressful. to waste a moment on yesterdays. What a great reminder to let go of mistakes, not to dwell on problems that are minor but frequently seem like major mountains in the moment. Who doesn’t need to remember this at times? I posted this at work because I have a tendency to really obsess about mistakes I make at work. Well, you know, I work in a bankruptcy department working with data. To be honest, if I make a mistake (which I will, being human and all), nothing truly life-threatening will happen. This isn’t to say that I need to NOT make mistakes, but it does mean that I need to not stress so MUCH about the mistakes I make. I try to learn from the mistakes I make, so that in the future I won’t make the SAME mistakes over and over. But this is a good reminder that we should all let it go. Let go of the silly things, the irritating things that happened over the course of the day. Stress is a state of mental or emotional strain or suspense. It can also be difficulties that cause worry. There are two basic types: acute stress or chronic stress. Acute stress is short-term; it is the body’s response to something that seems dangerous. Examples would be accidents or near-misses. Chronic stress is something to continues for long periods, like stressful situations or events. A separation or a bad work situation would probably result in chronic stress. When you are stressed, your body goes reacts as if it is under attack or in danger – this is the fight-or-flight response. It causes your body to produce hormones that speed up your heart, make you breathe faster, and give you a burst of energy. It is entirely possible to exhibit symptoms of stress and think that you are simply sick. Symptoms of stress are numerous and vary from person to person. There are physical symptoms such as headache, heart palpitations, chest pain, stiff neck, and back pain, as well as upset stomach and nausea. Note that some of those symptoms are indeed symptoms of other issues and may need the attention of a doctor – chest pain, in particular! Other symptoms are emotional: anxiety, lack of focus, depression, sadness, anger, restlessness, feeling insecure and irritablity. Burnout is also a symptom of stress. You may also exhibit behavioral symptoms, which may include changes in eating patterns (either more or less), drug or alcohol abuse, social withdrawal, crying spells, and relationship conflicts. It is important to pay attention to what your body is telling you! If you ignore high levels of stress, you can truly make yourself sick. And that brings us to the effects of stress – which are numerous and can be serious. It can affect your immune system, literally making you more likely to get sick – and to get sick more often. If you have a chronic illness, it can make those symptoms worse. It can make skin problems like acne and psoriasis worse. It can cause nagging headaches, forgetfulness, and decreased productivity at work. You may feel tired all the time, irritable, and may be quicker to lose your temper. Who is most susceptible to stress? People without strong support netowkrs, those who are poorly nourished, and people who don’t get enough sleep. Other groups that show a higher liklihood of suffering from the effects of stress include those with chronic illnesses, children, teens, working parents, and seniors. Many of these groups have stressors that tend to be related to life transitions such as more and more responsibility, the change from not having children to having children, and retirement and growing health issues. Speaking of stressors – what causes such levels of stress? Well, stressors can be either pleasant or unpleasant events. Both sets can cause tremendous levels of stress. For example, significant life adjustments like marriage, divorce, separation, birth of children, and gradation are all sources of stress, even if some of them are happy occasions. Buying a house is another example – it is a happy event, but the paperwork, the legal documents, the move are all stressful. Stress can also come from daily routines: sitting in traffic, getting the children up and ready for school in time for the bus, deadlines at work, and running kids back and forth to after-school events can all cause stress. Unrealistic self-expectations – like expecting perfection – can certainly be stressful. Interpersonal relationships, including both work/social relationships and personal relationships, can cause a lot of stress. Common stressors include balancing work and family, anger management, legal issues, financial problems, health issues, family problems, addictions, caring for an elderly relative, school, and career changes. Take a 15-minute break from what is stressing you. Walk a way and come back to it when you are calmer. Write out what is worrying you and set it aside for 15 minutes. Look at the worst-case scenario. If that happened, how bad would it really be? How likely is it to really happen? Sit outside in the fresh air and sunshine for a short period – about 15 minutes. Delegate when you can – ask for help. People who care about you frequently want to help. Are you stressed because you are too busy or are overcommitted? Well, look at changes you can make. Decline some of the requests. Set aside time for yourself and your family. Set aside 10 minutes when you walk in the door in the evening to unwind before jumping into housework and household routines. Declutter – clutter can cause stress. Clean up in small increments: one area at a time. Look at what really needs to be done and prioritize. Ask yourself if there is anything you can do to change the situation. If not, why worry? Let it go. If you CAN do something, then DO it instead of worrying! Talk to someone! Get advice – or simply talk. You may want to let your friend/listener know if you simply need to vent. Help someone else – it will help take your mind off of things. Make sure you get a good night’s sleep. It helps you deal with things better and stay calmer – and it helps you stay healthy! Watch your favorite movie or read your favorite book – use it as an escape for a little while. Before you make a major change, weigh the pros and cons. If you’ve made a mistake, look at what you can do to fix it. If you can’t, apologize if appropriate and look at ways to make sure it doesn’t happen again. Then let it go. Take a deep breath and count to 10 before reacting. If you are stuck regarding a specific issue, put it aside and move on. Think about, or work on, something else and give your subconscious time to work. You’d be surprised at how often you’ll get an idea when you are least expecting it. Focus on positive achievements, positive changes, and surround yourself with positive people. Cut back on caffiene – it will help you feel less on edge. Learn to allow yourself an extra 10 minutes to get places. Get up 10 – 15 minutes earlier in the morning to make your morning less harried. I admit that my focus here is on Christmas because it has become far too commercial, but really, we’ve gotten away from the meaning of many holidays. At any rate, here are a few suggestions on ways to put joy back into your holidays. Simplify. Enjoy being with family, watching children celebrate, good food – remember the GOOD things about the holidays. Don’t get caught up in commercialism, overindulgence, trying to go to every party or event. Pick a few nice events that you really want to attend and simply spend time enjoying family and friends otherwise. Don’t overspend – or overindulge. Overindulgence in food or alcohol (or both) will leave you feeling out of sorts, uncomfortable, and generally unhappy. Enjoy the treats of the holiday – but do it in moderation. As for spending, you can avoid that type of hangover as well, by not overspending either. Buy gifts – or better yet, make them – that mean something between you and the recipient. Spend time really thinking of something they would enjoy. Eat what you enjoy – but enjoy what you eat! It is so easy to overdo it with food. Keep in mind at each meal that it isn’t the last chance for you to eat anything on the table; you can always get more at the next meal. Try to keep your portions down to reasonable sizes; if you are going to have dessert, for example, have a small piece of pie rather than a larger one. Eat one cookie, rather than four. Eat only what you really enjoy – once you are getting full, you lose the true enjoyment of what you are eating. Say NO. It really is possible to tell a friend or family member, “I’m sorry but I can’t make it that night. Why don’t we try to get together when things quiet down a little?” Just be firm and polite. Stop…and look at the lights, listen to carols, visit Santa (or not). Take the children on a drive on weekends to see the Christmas lights. Listen to Christmas carols and sing along. Visit Santa, if that is important to you as a family tradition – or skip it if it causes too much aggravation and stress. Focus on what is important to you and your family and cut out the things that simply do not measure up. If it is a source of stress, don’t do it. There is enough going on during the holidays that it doesn’t make sense to do things that make you tense. Obviously, there are some things that you simply cannot avoid, but do what you can. Cut back on your commitments, focus on the ones that mean the most to you. Cut back on the cards – write meaningful letters to those closest to you. I’m not talking about the mass “family newsletter” that so many people do. I’m talking about chatty family letters to those closest to you to let them know how much they mean to you and what’s going on with you. Write to older relatives that you don’t get to see often and enclose pictures; they will LOVE it. Sit down to dinner as a family. Everyone may be busy during the holidays, with school plays, concerts, work parties, family parties, and the like. Still, even if it is with fast food, make time to sit down with your family over dinner and talk about what is going on with everyone. It CAN be done and it will help everyone stay calmer. Make time for your hobby. If you have a hobby that relaxes you, it is particularly important to try to make time for it when you are stressed. Even if you can only work it in for 15 minutes a day or so, that will help. Read a book, write, keep a journal, crochet, knit, … find something that relaxes you and find a few minutes each day. Be sure to get your sleep. At least one night a week during the holidays, make a point of going to bed early. Try half an hour early the first night and see how much it helps. Make your meals – at least SOME of them – healthy. Holiday foods are fantastic, but frequently not healthy at all. Try to make other meals more balanced and healthier. Try to eat less fat, less sugar, and drink less caffeine and alcohol. Work in a salad or two. Make sure you get some fruit – preferably some that isn’t in pie, jelly, or dipped in chocolate. Take time for yourself each day, even if it is just 5-10 minutes. This can be spending time on a hobby, taking a walk around the block (or around your office building), time soaking in the tub, quiet time alone in your bedroom, or even quiet time in your car on the way to work. Take a few minutes at lunch during the week to sit in the car and listen to your radio. If you have an office at work, close your office door for five minutes at the beginning of the day to gather your thoughts for the day, or for five minutes at the end of the day in order to plan for the evening or for the next day. If you have any other suggestions, please feel free to contact me or leave them in a comment! Myfootprint.org – you can take a quiz to determine your impact on the earth and find ways to improve it! The Green Guide – this site has green living tips, blogs, recipes, tips of the week, and more. I found it very helpful. The Daily Green – this site has tips and advice, news, green home section, and more. There is a green cuisine section that includes parts on safe foods, recipes, and food blogs. There are community tips and more. You can join the community – or not. There is also a newsletter. Do It Yourself – this is a very helpful site with information on all sorts of projects for the home, car, going green, lifestyle, crafts, cleaning, and more. There are forums to participate in, product information, and product reviews. Do It 101 – this is a good way to spend time; I could have browsed here for quite a while – if I could find the time. There are articles on a wide, wide range of subjects. For example, under Animals – Cats, I found articles on caring for newborn kittens, 5 common diseases, patterns to make cat toys, and recipes for treats. CNET Tips and Tricks – If you are looking for computer tips and advice, this is a good place to go. I found articles on adware, antivirus issues, tips on photography (particularly digital – things like avoiding fuzzy pictures, adding people to pictures, how to share your digital pictures, and so on), as well as tips for iPods and HDTV, among other things. Looks like a good library of information to check out. The Simple Dollar – this site has some great articles on ways to save money, projects that can help you improve your financial situation, and so forth. I highly recommend it. Frugal Living – This is on about.com and covers a wide range of tips on saving money. There are sections on everything from frugal living 101 to frugal seniors, as well as frugal fun, special occasions, and affordable transportation. 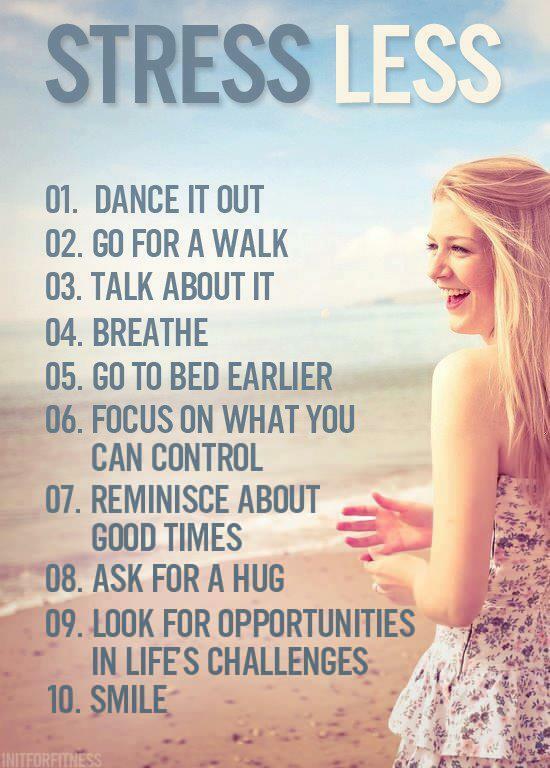 Stress Management Tips – Well, this is certainly to the point. The title says a lot – but there is more to the site than tips. There are sections on causes of stress, effects of stress, and on ways to handle different kinds of stress. There are also stress relief games and exercises. If you need stress management help, this is a good place to go. Stress Center – Mayo Clinic – another good place to look for information on stress symptoms, relaxation techniques, stress management articles, and so on. This is a very informative site – for a wide range of topics. Helpguide.org – This site has a ton of articles on various “life challenges”. I found it while looking for information on stress relief but discovered that there is a lot more to this site. Other topics include autism, anxiety, children & parenting, depression, eating disorders, relationship issues, sleep, and stress and trauma. Widgetbox – If you want widgets for iGoogle, My Space, Facebook, WordPress, and other similar sites, this is the place to go. They have categories for blogs, countdowns, clocks, pets, news, humor, and so on. In addition, you can make your own. This is a lot of fun. World Religions – this site has a number of articles on some of the world’s major religions. Mind you, this is not a huge list, but it is a good place to start. Refdesk/Religion – I believe that I mentioned refdesk.com in another edition of this monthly feature. However, this is a nice enough list that I thought I should repeat myself a bit. This page has a list of 114 items related to various religions. Some have discriptions, some do not. I think this is a great starting point for looking into other religions – or even your own. Go to bed 15 minutes earlier and get up 15 minutes earlier. Lay out your clothes the night before. Be sure that everything you need to take with you is in one place the night before. Pay attention to what stresses you. Do you get stressed in traffic? If so, why? Is it because you are running late? If it is, look at ways to adjust your schedule – or ways you can manage your time better in the morning. Are you stressed by a crying child? Are you just overtired? Can you call someone to help you and give you a break? Put the child down somewhere safe, like a crib, for 10 minutes and take a small break. Are you stressed about a big project? Break it down into smaller steps, then break those down into smaller steps and continue this process until you have manageable steps to follow to finish the project. Look for ways to strengthen your physical reserves. Be sure to get a good night’s sleep as often as you can. Go to bed earlier and go to bed at the same time every night; you should find that you feel better if you stick to a routine. Get exercise as many days a week as you can; a recent study found that even 30 minutes of moderate exercise three times a week helps. Eat healthy meals; you’ll feel better if you avoid fast food and junk food as much as possible. Watch your caffeine intake; it can increase nervousness and cause irritability. Don’t forget to laugh – watch a funny movie, read a funny book, watch comedians…laughter can be very helpful. In addition, try keeping a journal or just writing out what you are feeling or going through; you don’t even need to keep it if you don’t want to do so. Sometimes the simple act of writing it out will relieve stress. Have a cup of tea and a scone. Curl up with a cup of hot chocolate (coffee/tea) and a good book. Soak your feet, then rub moisturizer into them. Write in a journal (or a blog). Make a list of all the things you need to do so that you can check them off as you complete them. Make a list before bed of all the things you are worried about, then go to sleep. Cry – sometimes that is just what you need. Go outside and enjoy the good weather, even if it is only for 10 minutes. Encourage someone who is struggling. Have soup for dinner in the winter – or a nice stew. Make your favorite meal for dinner. Spend the day in pajamas. Don’t read the news (online or paper) first thing in the morning – it is usually a depressing start to the day. Do something nice for your significant other. Take your child to the park. Blow bubbles with your child. Turn off the phone (or phones). Turn off the TV, put on some music, and read. Take some deep breaths and step back from the situation until you are calmer. Create something: bake, model clay, cook, whatever. Bake bread – the effort of kneading the dough will work off some energy and the smell of bread baking is incredible. Make soup out of whatever you have in the house. Be creative. Light some candles and soak in the tub. Find a pool and go swimming. Go for a long walk in the woods. Go for a walk on the beach. Turn off electronics for a day – no tv, PDA, pager, computer, etc. Lose yourself in a computer game for a little while (mind you – for a little while). Make a list of everything you need to do the next day before bed so you stop worrying about those things. Break a project down into manageable steps and do the first one. Stop trying to multitask – do one thing at a time and do it well the first time.